Image caption The Met's Directorate of Professional Standards has been made aware of the crash. A teenage boy is in a life-threatening condition after the moped he was on was involved in a crash with a bus in Putney, south-west London. 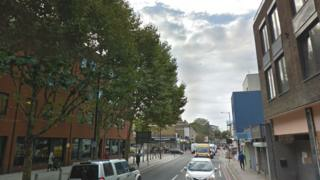 The 17-year-old was being pursued by police after failing to stop for officers at Putney High Street at 01:20 GMT, according to the Met. A short time later the moped collided with a bus on Upper Richmond Road and the rider was taken to hospital.